Political opinion articles as an ideologically-loaded type of political discourse are largely produced to serve the society to which they belong. When translated, they could be manipulated to meet the socio-political needs of the target society. Translation Studies scholars have adopted a variety of critical approaches and methodologies to account for such manipulations, inspired by the principles of Critical Discourse Analysis (CDA) and under the critical translation movement. Though van Dijk’s sociocognitive notion of CDA is widely employed, his ideological square has rarely been looked into as an analytical framework. The present paper aims to investigate how van Dijk’s ideological square can be used to explain manipulation, and accordingly, be proposed as a model. To achieve this objective, a collection of 31 English opinion articles, along with their corresponding Persian translations, are analyzed. The analysis of the articles confirms the adequacy of van Dijk’s ideological square to account for manipulation in (political) discourse translation at a sociocognitive level. At the textual level, however, some modifications are suggested. ©inTRAlinea & Ali Jalalian Daghigh, Mohammad Saleh Sanatifar, Rokiah Awang (2018). "Modeling van Dijk’s Ideological Square in Translation Studies: Investigating Manipulation in Political Discourse Translation", inTRAlinea Vol. 20. The influence of political factors and, more specifically, ideology, has widely attracted the attention of scholars researching (news) translation in situations of conflict (among them Ku and Nakamura 2005; Orengo 2005; Holland 2006; Darwish 2006; Baker 2006; 2010a; b; Kang 2007; Valdeón 2007; 2008; Munday 2007; Chen 2009; Loupaki 2010; Gumul 2010; Alhejin 2012). Regardless of their methodology, all the scholars have unanimously agreed that the political context in which the target text (TT) is produced leads the trans-editor(s) to manipulate the TT. Manipulation is a term originally concerned with literary translation and was first used by the scholars of the Manipulation School (e.g., Hermans 1985 and Lefevere 1992). Generally, there are two views on manipulation in journalistic/political translation. Some scholars consider it as translation acts by means of which linguistic and cultural barriers are transcended and communication is facilitated (e.g., Schäffner 2005; Bassnett 2005; Bielsa and Bassnett 2009). However, in the political context of translation, manipulation is generally perceived as political/ideological manipulation, because political translation implies a degree of manipulation of the source text (ST) for a certain purpose, to bring the target text in line with a model and a notion of correctness, and in so doing, ensures socio-political acceptance. Therefore, manipulation has also been considered a filter through which a specific representation of ST is promoted (e.g., Orengo 2005; Tsai 2005; Kuo and Nakamura 2005; Holland 2006; Darwish 2006; Kang 2007; Valdeón 2007; Gumul 2010; Loupaki 2010). The current study considers manipulation from the latter perspective. The question is, which analytical framework can serve to investigate manipulation in translation from this perspective? We believe that Critical Discourse Analysis (CDA) can be the answer. However, very few studies (for example, Kwong Leung 2006; Ietcu-Fairclough 2008; Schäffner 2004, 2012; Alhejin 2012) have made an attempt to link translation studies and CDA either theoretically or methodologically. This could be the reason why Schäffner (2004; 2012) refers to the lack of, and necessity for, a ‘critical translation analysis’ subfield within Translation Studies. In this article, van Dijk’s ideological square, as a component of his sociocognitive approach to CDA, is employed as the analytical framework to investigate manipulation in the translation of political news opinion articles. First, the appropriateness of the framework will be argued. Then, we will show how the framework links with Translation Studies and serves as a model for investigating manipulation in political discourse translation through the analysis of 31 Persian translations of English opinion articles. Since the ideological turn in Translation Studies, ideological and political factors have drawn the attention of translation scholars to the study of translation context. Schäffner (2004; 2010a; 2012), Kwong Leung (2006) and Ietcu-Fairclough (2008) argue that translation is no longer concerned with the traditional notion of equivalence, but has turned towards the socio-cultural and political context of the translation in which the translators work. They call on researchers to use the concepts of CDA in their studies, as CDA and TS have a common ground. That is, CDA and TS share the idea that textual features should not be interpreted without considering the ideological context of text production and reception. Ietcu-Fairclough (2008) points out that translators work under certain socio-political conventions and restrictions which serve the wider values and ideologies of power holders in society. Thus, the strategies employed by translators are aimed at the production of a text in line with set values. This is even more significant when it comes to political discourse translation, in general, and opinion articles, in particular. Political opinion articles, as opposed to hard news articles, are believed to be significantly loaded with ideologies (Bell 1991; van Dijk 1995). As van Dijk (1995: 15) argues, opinion articles are ‘rather institutional than personal, shared among several editors and other social groups they belong to’. That is, they are consistent with the beliefs and values of the dominant socio-political frameworks of the institutions themselves and the wider society to which they belong (Hodge and Kress, 1993). Schäffner (2012) argues that the translational activities which mediate such discursive events, as editorials of newspapers and news websites, are much more complex than translation proper. The discursive events are recontextualized and mediated by translators or, in her words, ‘agents’ or ‘political actors’ (Schäffner 2012: 104), in accordance with the constraints and conventions of the news agency. Likewise, Vuorinen (1995) and Darwish (2010) maintain that translation in news agencies is influenced by institutional policies and ideologies to justify and control actions and their outcomes. Therefore, translators are not the only people who decide on the translation; their work is edited by others such as senior translators, editors and the chief editor (Hursti 2001; Bielsa 2010). Over the past few years, translation scholars have attempted to apply CDA in their studies to look at the influence of such conditions on (news) translation (e.g., Júnior 2004; Kuo and Nakamura 2005; Tsai 2005; Orengo 2005; Holland 2006; Munday 2007; Kang 2007; Valdeón 2007; 2008; Chen 2009; Al-Hejin 2012). It should be noted that these studies are flawed for two reasons. First, studies such as Júnior (2004), Tsai (2005), Darwish (2006), Chen (2009) are limited to the investigation of manipulation on a lexical level. Second, others are case studies which analyse a single article (e.g., Darwish 2006; Holland 2006; Munday 2007; Alhejin 2012; Jalalian Daghigh and Awang 2014); thus, they do not lead to broader conclusions about, and a better understanding of, ideological manipulation in political discourse translation due to the limited breadth of their data. Therefore, there is a need for a study with a broader set of data which goes beyond mere lexical analysis. The portrayal of the conflicts between Iran and the Western world have also been among the points of interest in investigating the influence of ideology on the news language. Khanjan et al. (2013) draw on van Dijk’s sociocognitive approach to investigate certain ideological aspects of news headlining in an English-Persian transla­tion context. They sug­gest that the polarization of Us and Them is influenced by the target news producers’ (dis)approval of the ideological content of the source headlines and is represented through preserving, manipulating or excluding original head­lines in the target news stories. They argue that the translation strategies used are realized through the purposeful application of linguistic expressions (both at lexical and grammatical level) or non-linguistic elements (such as images, photos, and graphic drawings). Jalalian Daghigh (2015), drawing on van Dijk’s approach to CDA, studies the manipulation procedures involved in news translation. Sanatifar and Jalalian Daghigh (2018), investigate, from a socionarrative perspective, how the Iranian media, through translation, directed the public perception of the social and political realities about its nuclear program through reframing as it was already framed in the Western media. Unlike Khanjan et al. (2013), Jalalian (2015), and Sanatifar and Jalalian Daghigh (2018), other researchers have conducted monolingual studies by comparing the news texts produced by different English language presses. For example, Atai and Mozaheb (2013) study the portrayal of Iran’s nuclear program in some British news media by focusing on editorials in the Guardian, the Daily Telegraph, the Times, the Independent and BBC. Shojaei, Youssefi, and Hosseini (2013) examine the portrayal of three conflicting points between Iran, the West, and the USA by looking at some British and American newspapers such as Independent, the Guardian, the New York Times, the Los Angeles Times, and the Washington Post. Drawing on van Dijk’s ideological square, they conclude that the Western media were biased, as they had attempted to represent Iran and its allies negatively, and the West positively. Other studies have compared Western news texts in English with Iranian-Persian texts covering the same topic. Applying Fairclough’s CDA model and guided by van Dijk’s ideological square, Behnam and Moshtaghi Zenous (2008) compare the coverage of the Iranian nuclear program in two Iranian newspapers, i.e., Iran Daily and Kayhan, as well as in two British newspapers, i.e., The Daily Telegraph and The Guardian. The results of their study show that the British media delegitimized the Iranian nuclear program, whereas the Iranian media portrayed it positively. Their study highlights a few points. First, they have gone beyond mere analysis of lexical choices by taking transitivity procedures, namely nominalization, and passivization, into account. Second, by looking at the domestic media, which support government policies, and by comparing it with the Western media, they shed light on socio-political factors, which based on CDA, explain different uses of language by the media. Nevertheless, without denying the merit of these studies, it is noticeable that by merely looking at parallel texts produced in two different contexts, it is not possible to uncover manipulations carried out by news trans-editors. 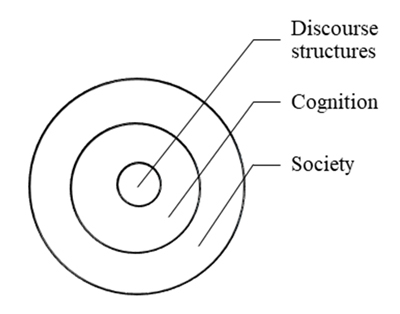 Van Dijk’s (1993a; 2001; 2005) sociocognitive approach to CDA consists of three components: society, cognition, and discourse. At the macro level is the society which is concerned with power relationships at the level of local interlocutors and global societal structures. In his approach, social power is understood as a means of controlling the mind and action of groups and people. At the micro level is discourse, which refers to various discourse structures (language) encapsulating ideologies. The main point that makes van Dijk’s framework different from Wodak’s historical (2001) and Fairclough’s socio-cultural notions of CDA (2001) is the mediating layer of cognition (ideology), which, as illustrated in Figure 1, lies between society and discourse. Van Dijk (1998) points out that the meaning of the text is embedded in the discourse by language producers, and as such, it exists and is represented in their minds. Therefore, the cognitive properties of participants’ discourse, as part of the contextual analysis, is emphasized in his framework. Accordingly, van Dijk (1993b; 2002) conceptualizes ‘ideological square’ as a framework through which discourse comprehension and production can be analyzed and linked to the context (society). b) Negative-Other Representation: representing the out-groups’ members (Them) negatively, via discourse, by de-emphasizing their positive and emphasizing their negative features. Besides the 24 discourse structures identified by van Dijk (1998), ideology may be represented in the text via syntactic features of language as well. Since van Dijk has not included these features in his framework, the linguistic toolkits which are set forth by Hodge and Kress (1993), and Fowler (1991) and Fairclough (1991), i.e., passivation, nominalization, modality, and theme/rheme change, are employed in this study as well. In the following, a background of Iranian media policies and what forms the ideological Us and Them in the country is provided. 3) violate political, social, economic, and cultural policies of the Islamic Republic of Iran. 3) promote the policies of the Islamic Republic of Iran worldwide. The data collection began by looking at the target text published on the Iranian news website Diplomacy-e-Irani (Iranian Diplomacy). A total of 31 Persian news opinion articles, which were all translated from English into Persian, were obtained from the archive of the news website within a period of 3 months, dated from April 1, 2013, to June 30, 2013. All the articles discuss the controversies between Iran and the West over Iran’s nuclear program. This period was preferred for data collection because the researchers believe that conflicts and tensions between the Iranian government and the Western powers over Iran’s nuclear activities had reached its highest level up to that time. In fact, more and more ideologically-loaded articles were then being published. Then, their corresponding English source texts were obtained from 18 news agencies and websites including Reuters, The Washington Post, The Guardian, The New York Times, Aljazeera, Los Angeles Times, The Telegraph, Foreign Policy, Haaretz, The National Interest, The Christian Science Monitor, Project Syndicate, The Diplomat, Inter Press Service, Bloomberg View, Policy.Mic, Executive Magazine, and The Atlantic. To carry out the analysis, initially, the English opinion articles (ST) are analyzed based on van Dijk’s (1998) ideological square framework. After identifying the ideological significance of the source texts (see Figure 2), through comparing the source (ST) and target text (TT), the ideological mismatches are described, categorized and evaluated. مواجهه با غرب خرج کردند. بهترین راه برای متوقف کردن برنامه های هسته ای ایران تعیین یک خط قرمز مشخص است. BT (of TT1): the group 5+1 to negotiate with Iran should demonstrate the same fortitude that Iranians within these years have spent in facing the West. The best way to stop Iran’s nuclear program is to determine a red line. The above statement is taken from an opinion article in which the author criticizes Iran’s nuclear program while proposing what should be done (norm expression) to make a deal with Iran. The expressions ‘guardians of the Islamic Republic’ and ‘disarming Iran’ in the ST show the negative opinion of the author toward Iran and its nuclear program. Comparison of the ST and the TT shows some mismatches, which could be explained in terms of ideological manipulations. First, ‘guardians of the Islamic Republic’ refer to the officials of the political system who look after the benefits of the regime (Persian-English Dictionary of Politics and Journalism, 2005). This is translated into ایرانی ها irāniha [Iranians]. In fact, by categorizing a particular group who favor the Islamic Republic (the political regime), the ST author refers to a minority who supports the nuclear program, but this is generalized to Iranians, as a case of creating populism in the TT. Thus, a TT reader may interpret that a big population is on the side of Iran’s nuclear program. Secondly, ‘disarming Iran’ is translated into متوقف کردن برنامه های هسته ا ی motevaqef kardan barrnāme hāyehastei. [to stop Iran’s nuclear program] while, according to Progressive Aryanpour Dictionary (2010) and Oxford Advanced Learner’s Dictionary (2015), the word ‘disarming’ refers to taking away someone’s weapons. This is a change of perspective which not only filters a negative depiction of Iran, but also, may represent the West negatively; thus, a target reader may interpret this as stopping a program which could be the right of a nation. Therefore, in all the cases discussed above, there is an attempt by the trans-editor (s) to block the negative representations of the in-group (US) in the TT. The procedures of blocking are listed and explained in Appendix A.
ST2: It would have to agree to completely open all Iranian nuclear facilities to regular inspections by the IAEA (which has thus far refused to do so) (Purzycki, 2013). نخست ایران باید مجوز ورود بازرسان به تمامی سایت های هسته ای اش را بدهد. BT (of TT2): First Iran would give permission to the inspectors to enter all its nuclear sites. Some information may remain implicit, as it may be shared knowledge with the recipients and inferred from context. However, there are other reasons for implicitation. For example, for cultural purposes such as politeness, an unacceptable expression might become implicit. In addition, political motivations may lead an author to leave an expression implicit (van Dijk, 2005). While negative features of an in-group may remain implicit or mitigated through euphemism, the negative features of an out-group may be explicated (van Dijk, 2005). The ST clearly states that Iran has so far refused to allow the IAEA inspectors to inspect its nuclear facilities. However, this is omitted in the TT. As such, implicitation is used to demote the negative representation of the in-group in the TT. The procedures of ‘demotion’ are explained in Appendix A.
ST3: At the last round of talks, in February in Kazakhstan, the United States and five otherworld powers offered Tehran modest concessions, including softening limits on trade using gold and other precious metals, and easing some restrictions on petrochemicalexports, if the Iranians agreed to halt production of medium-enriched uranium. The Iranians did not accept the offer (Ritcher 2013). Disclaimer is a combination of positive self-representation and negative other-representation and saves face by emphasizing the positive features of an in-group and representing an out-group negatively by focusing on their negative features. In the above example, both positive representations of the out-group and negative representation of the in-group are expressed via disclaimer. In fact, the ST depicts the out-group positively by stating that a good offer from the United States is turned down by the in-group. However, it is blocked from entering the TT by complete omission. In fact, the negative representation of the in-group, as well as the positive representation of the out-group are both manipulated in the TT. ST4: […] we believe we have put forward a good, comprehensive, fair, and balanced approach; a confidence building measure that we think is a good start (Peterson, 2013). Groups and individuals might be addressed by neutral terms. However, ideologically and politically motivated discourses are influenced by power holders’ attitudes towards certain people or groups. Thus, a polarized term used to refer to an in-group (positively) and an out-group (negatively) is a marker of the ideology of a group towards its in-groups and out-groups (van Dijk, 2005). In the above example, the author quotes what Ashton, the leader of the Western powers in negotiations, states on the proposal which has been given by the West. As can be seen in the ST, this part of the text is a positive representation of the West and their proposal. Besides that, the use of the first-person pronoun ‘we’ in three cases shows Ashton has polarized the Western powers in a positive way. However, comparison of the ST and the TT shows that ‘we’ is translated into آنها dey [they], which alludes to the third person plural pronoun. This reveals that the trans-editors consider themselves to be members of the target society. As a result, they have attempted to change the perspective by stating that “they say […]”, rather than expressing it from the ST point of view. In addition, except for the word ‘good’, which is translated correctly into خوب xub [good], the other positive features are omitted in the TT. As such, the positive representation of the Westerners is demoted by omitting some information. The procedures of ‘demoting’ are explained in Appendix A.
ST5: Based on my personal experience, Rowhani is a polite and open character (Fischer 2013). BT (of TT5): Based on my personal experience, Rowhani is a polite man with open character. In discourse, an actor can be described as a manifestation of a group ideology towards what they consider as in-group and out-group. The above source text reflects the author’s positive stand on the election of the new president of Iran (Rowhani), who brought positive changes to the nuclear standoff between Iran and the world powers. The author’s positive attitude is encapsulated through the words ‘politeگ and ‘open character’ in the ST. The reference to the aforementioned words is made by مودب moadab [polite] and شخصیت باز ŝaxsiati bāz [open character] (Hezareh Persian-English Dictionary, 2010), in the TT. Comparison of the ST and the TT shows no ideological manipulation. As a result, the positive representation of the in-group is preserved in the TT. ST6: Unlike outgoing president Mahmoud Ahmadinejad, he surrounds himself with very skilful and experienced diplomats (Fischer 2013). سیاستهای متعادل گرانه ایشان در پست های گذشته اش نشانگر این است که مرد فرهیخته ای است. This example, also, reflects the ST’s author positive point of view on the election of the new president of Iran. In the ST, Rowhani is compared with the former president, Ahmadinejad, and described positively through the words ‘skilful’ and ‘experienced’. The trans-editor(s) has rendered the above words to کارآزموده kārāzmude [skilled] and باتجربه bātajrobe [experienced] (Hezareh Persian-English Dictionary, 2010), respectively. These translations are both in line with the meaning of the ST words. However, the addition of some positive representation in the TT, which does not exist in the ST, intensifies the already positive representation of Rowhani in the ST. Like the previous examples, this example represents the way DPR is manipulated. By applying certain procedures, the ST positive representation of the in-group is promoted in the TT. The procedures of promotion are explained in Appendix A.
ST7: if Washington recognized Iran’s right to enrich, a nuclear deal with Tehran could be reached in matter of weeks (Leverett & Man Leverett 2013). اگر واشنگتن حق غنی سازی ایران را به رسمیت بشناسد امکان دستیابی به توافق بر سر پرونده هسته ای ظرف چند هفته ممکن خواهد شد. BT (of TT7): If Washington recognizes Iran’s right to enrich, the possibility of achieving an agreement on the nuclear issue would be possible within a few weeks. The discourse of counterfactuals warns about something that would happen as the result of the problem created by another group. The ST’s author assumes a positive outcome leading to a nuclear agreement, if ‘Washington recognized Iran’s right with regards to its nuclear programme’. In other words, the author represents the USA negatively by criticizing the policy of the American government as well as the Western powers toward Iran’s nuclear program. Comparison of the ST and the TT suggests that the negative representation of the out-group is transferred from the ST to the TT without any manipulation. Therefore, the negative representation of the out-group is preserved in the TT. ST8: And Obama’s decision last week to send small arms to the rebels in Syria is hardly a step likely to make Iran feel better about Washington’s regional objectives (M. Walt 2013). برای مثال تصمیم هفته گذشته اوباما به منظور ارسال سلاح برای معترضان سوری قطعا بدبینی بیشتری را در نگاه ایران نسبت به اهداف منطقه ای واشنگتن حاکم کند. BT (of TT8): for example, the last week decision by Obama to send arms for Syria rebels absolutely sheds more pessimism on Iran’s view toward Washington’s regional objectives. In the above example, the author blames Obama for sending arms to Syria for the problem it may cause in the path toward a probable deal between Iran and the USA. Comparison between the ST and the TT suggests that this depiction is transferred to the TT. However, it is worth mentioning the few ideological manipulations. Firstly, the adjective ‘small’ in the ST phrase ‘small arms’ shows that the author has specified the type of arms to be sent. This is translated into سلاح selāh [arm] (Progressive Aryanpour Dictionary, 2010). The omission of this adjective (generalization) may alter the TT reader’s interpretation of the act of the out-group. That is, the reader may imagine that the USA has sent heavy arms rather than small arms. Moreover, the modals ‘hardly’ and ‘likely’ show that the author’s degree of certainty toward the obstacle that may be brought by this issue is not necessarily high. These two modals are replaced by قطعا [absolutely] in the TT. In this view, a higher degree of assurance is represented toward the expressed burden being caused by Obama’s decision. Finally, the replacement of ‘to make Iran feel better’ in the ST withحاکم کند بدبینی بیشتری را درنگاه ایران badbini biŝtari ra dar negāhe irān hakem konad [dominates more pessimism in Iran’s view] in the TT expresses a stronger sense of negativity of the out-group act and the negative impact it may have on a probable deal. As such, the negative representation of Obama and his policies are promoted in the TT. As stated earlier, the ST analysis suggests four patterns of representation. Table 1 displays the percentage of the four UNR, UPR, DPR, and DNR patterns. As the table displays, UNR is the most frequent (about 70%) and DPR is the least frequent pattern (about 3%) of the representations as observed in the ST. This suggests that the ST is heavily loaded with negative representations of Iran and its allies (UNR). Moreover, the ST also includes undesirable positive representations of the other groups (UPR). In total, 82 percent of the ST representations are in conflict with the cases which are stipulated in the Iranian media law. As a result, it is far from expectation that the translators simply transfer the undesired representations to the TT intact. Table 2 summarizes the ST representations as manipulated in the TT. As the table displays, the undesired representations have been treated differently from the desired representations. The first category is the undesired negative representation of the in-group. In total, 97% of this category’s representations have gone through manipulations, out of which 53% of the cases are blocked and 44 % are demoted. The second category is an undesirable positive representation of the out-group. In total, 86% of all the ST representations are manipulated, out of which 57 % of the cases are blocked and 29% are demoted. The third category is a desirable negative representation of the out-group. Overall, 51 % of all the ST representations are promoted. Besides, by an intact transfer of the discourse to the TT, without applying any manipulative procedures, the remaining ST representations are preserved in the TT, which includes 49% of the cases. The last category is a desirable positive representation of the in-group. Totally, 59% of all the ST representations have gone through promotion. Furthermore, by rendering the ST discourse to the TT without applying any manipulative procedures, the ST representations are preserved in the TT, which includes 41% of the cases. As the table reveals, while preserving does not exist in the first two groups, it is dominantly used in the last two groups (DNR and DPR). This suggests that the trans-editors have preserved the positive representations of the in-groups and negative representations of the out-groups. One may argue that preserving may not be a manipulative pattern. However, by comparing its use among the four categories of the ST representations, it can be concluded that preserving has been applied deliberately to highlight the desired representations. This paper was an attempt to exploit common ground between manipulation in political discourse translation and van Dijk’s sociocognitive approach to CDA. As stated earlier, translation is an act of recontextualization. When a text is recontextualized, it is influenced by the contextual factors of the target society. Even though some transformations are unavoidable in the process of translation due to linguistic and cultural factors, the ones which are evident in this study cannot be interpreted as a result of constraints imposed by such related aspects. In fact, the data analysis suggests that the political discourse translators working at Iranian Diplomacy seem to have been restricted, among many, by the ideological factors governing the institution they work for. The institution per se is part of the society in which certain values are shared. The state ideology of the Iranian government is a good example of such conditions. The Islamic revolution has resulted in forming a polarized categorization which has been reflected in both the constitution and the media law. This leads the trans-editors to appeal to manipulations which can be explained in light of van Dijk’s sociocognitive approach to CDA. According to van Dijk’s (1998; 2005) monolingual notion of CDA, to sustain power, the power holders of society share their values and beliefs with the members to shape their mind. This takes place through text producers who shape the discourse to meet the expectations of the institution they work for. As stated earlier, cognition, or the ideological square as the mediating layer, plays the key role in van Dijk’s notion of CDA. In fact, text producers, being aware of the commission they have and guided by the factors underlying ideological square, produce a text which reflects the ideology of the powerholders through their discursive practices. By adapting van Dijk’s ideological square to the analysis of translated political discourse, the proposed model explains the political context which leads the trans-editor(s) to manipulate the TT as unanimously agreed upon by the TS scholars, though with some modifications. Analysis of the data shows that the ST consists of representations which conflict with the stance of the Iranian government toward the in-group (Us) and the out group (Them). Through the manipulative procedures, the undesired and desired representations are formed into representations which recreate a new discourse for the target text audience. The purpose of this appears to ensure that the target text is in accordance with the values and ideology of the target society. Figure 2 illustrates the application of van Dijk’s ideological square to illustrate these manipulations. The model which is developed through modifications to the originally monolingual CDA of van Dijk tends to focus on the ideological square in the context of the target society. The ideology of the target society power holders, which has roots in their stance toward the conflicts with foreign countries, is reflected in the TT discourse through manipulation strategies. It appears that the square can accommodate manipulation in the bilingual context of political discourse translation. According to van Dijk, discourse understood/produced in a society is, in fact, a representation of what goes on in the minds of the members. However, applying this to translation needs some modification. While in van Dijk’s model, discourse is a representation of what goes on the mind of the society members, the authors and the audience, in translation the author is the translator. In this study, therefore, the trans-editors’ decisions seem to have been influenced by the target society’s ideological square as reflected in the polarization of Us and Them. As such, it is concluded that the trans-editors tend to manipulate the ST representations based on Figure 3 illustration. Figure 3 illustrates van Dijk’s ideological square as applied to translation. As the figure reveals, trans-editors tend to positively represent their own group (Us) and negatively represent the other group (Them). However, as it is shown in the Figure, ‘de-emphasizing’ and ‘emphasizing’ the representations of the square need to be complemented by including the subcategories of ‘preserving’, ‘blocking’, ‘demoting’, and ‘promoting’. Therefore, the study proposes four strategies to investigate manipulation in political discourse translation in light of van Dijk’s ideological square. The strategies, except for preserving, are implemented through applying some manipulative procedures which are explained in Appendix A. The linguistic toolkits provided by van Dijk and the ones provided and shared among other CDA models, including Fairclough, Hodge and Kress, and Fowler, seem to be not enough in explaining all the manipulation procedures, most probably due to their monolingual nature of analysis. Therefore, by taking a descriptive-explanatory approach, the study has attempted to investigate the ones which are not explained by CDA (see Appendix A). The proposed model conceptualizes the important topic of manipulation in mediation of ideology as performed by political discourse translators. By being aware of the proposed model, translation critiques would be better able to make informed criticism of manipulation in translation. It would also help translation teachers and material developers to better explain and illustrate manipulations to their translator trainees, specifically in courses which deal with journalistic and political text translation. In addition, it facilitates the path of future researchers as it provides them with an analytical framework to uncover the manipulated discourses in translation. The current study investigated manipulation in translation by focusing on 31 opinion articles translated form English to Persian. Further studies on other genres of political discourse in other societies with different language pairs could be enlightening in developing the proposed model. To nullify an undesired negative representation of ST with a vague expression in TT, by not providing the details of the ST representation in TT, which leads to nullifying the representation. To minimize an undesired negative representation of ST by attributing the interests of a person or a specific group (high ranking officials) to many (people). To replace an undesired negative representation of ST with a positively-loaded item in TT so as to censor the representation. To partially remove an undesired representation of ST in TT so that the degree of representation is minimized. To lower the loading of an undesired representation of ST in TT by nominalizing, by which the details of subject and object are removed. To lower an undesired negative/positive representation of ST in TT by implying the meaning. To lower an undesired representation of ST in TT by replacing the probability/obligation of an event/action by using a modal, which expresses a lower possibility/probability. To particularize an undesired negative representation of ST in TT as opposed to the generality of a ST representation so as to lower the load of negativity. To omit the subject of an undesired negative representation of ST in TT as opposed to an active structure so as to remove the responsibility of the actor(s). To make a desired positive/negative representation of TT more explicit as opposed to that of ST.
To generalize desired positive/negative representations of ST in TT as opposed to the specificity of the ST representation. To intensify a desired positive/negative representation of ST in TT by replacing the probability/obligation of something by using a modal which expresses a higher possibility. To add subject to a desired positive/negative representation of ST in TT to intensify the representation. To intensify a desired negative representation of ST by either replacing it with a more negatively-loaded item or adding an extra negatively-loaded item. Al-Hejin, Bandar (2012) “Linking Critical Discourse Analysis with Translation Studies”, Journal of Language and Politics 11, no.3: 311-35. Aryanpour Kashani, Manouchehr and Seyed Mostfa Assi (2010) The Aryanpour Progressive Persian-English Dictionary, Tehran, Jahan Rayaneh Publishing Company. Atai, Mohammad Reza and Mohammad Amin Mozaheb (2013) “The Representation of Iran’s Nuclear Program in British Newspaper Editorials: A Critical Discourse Analytic Perspective”, International Journal of Society, Culture and Language 1, no. 2: 15-33. Bassnett, Susan (2005) “Bringing the news back home: Strategies of acculturation and foreignization”, Language and Intercultural Communication 5, no. 2: 120-30. Bell, Allen (1991) The Language of News Media, Oxford & Cambridge, Basil Blackwell, Ltd.
Baker, Mona (2006) Translation and Conflict, Oxon & New York, Routledge. ---- (2010a) “Interpreters and Translators in the War Zone: Narrated and Narrators”, The Translator 16, no.2: 197-222. ---- (2010b) “Narratives of Terrorism and security: Accurate Translations, Suspicious Frames”, Critical Studies on Terrorism 3, no. 3: 347-64. Behnam, Biook and Robabeh Moshtaghi Zenous (2008) “A Contrastive Critical Analysis of Iranian and British Newspaper Reports on the Iran Nuclear Power programme”, Systemic Functional Linguistics in Use. Odense Working Papers in Language and Communication, Vol.29, URL: http://static.sdu.dk/mediafiles/Files/Om_SDU/Institutter/ISK/Forskningspublikationer/OWPLC/Nr29/Biook%20Behnam%20%20%20Robabeh%20Moshtaghi%20Zenouz.pdf (accessed 16 September 2015). Bielsa, Esperança, and Susan Bassnett (2009) Translation in Global News, London, Routledge. Chen, Ya-Mei (2009) “Quotation as a Key to the Investigation of Ideological Manipulation in News Trans-editing in the Taiwanese Press”, TTR: Traduction, terminologie, rédaction 22, no. 2: 203-38. Deuter, Margaret, Bradbery, Jennifer and Joanna Turnbull (2015), Oxford Advanced Learner’s Dictionary: International Student’s Edition, Oxford, Oxford University Press. Fairclough, Norman (1995) Critical Discourse Analysis: The Critical Study of Language, London, Longman. ---- (2nd ed.) (2001) Language and Power, Edinburgh, Pearson Education Limited. Fowler, Roger (1991) Language in the News: Discourse and Ideology in the Press, London & New York, Routledge. Gumul, Eva (2010) “Explicitating Political Discourse” in Political Discourse, Media and Translation, Christina Schäffner and Susan Bassnett (eds) Newcastle, Cambridge Scholars Publishing: 94-115. Haghshenas, Ali, Samei, Hossein and Narges Entekhabi (2010) Hezareh Persian-English Dictionary, Tehran, Moasser Publication. Hastedt, Glenn (2017) American Foreign Policy: Past, Present, and Future, Lanham, Rowman and Littlefield. Hodge, Robert and Gunther Kress. (2nd ed.) (1993) Language as Ideology, London & New York, Routledge. Holland, Robert (2006) “Language (s) in the Global News: Translation, Audience Design and Discourse (mis) Representation”, Target 18, no. 2: 229-59. Hursti, Kristian (2001) “An Insider’s View on Transformation and Transfer in International News Communication: An English-Finnish Perspective”, Helsinki English Studies, Vol.1: 1-8. Jalalian Daghigh, Ali and Rokiah Awang (2014) “Intervention in Political Discourse Translation: A Case Study”, American journal of Translation Studies 6, no 2: 106-24. Jalalian Daghigh, Ali (2015) Mediation in English-Persian News Translation: A Critical Discourse Approach, PhD diss, Universiti Sains Malaysia. Júnior, Rodger (2004) “Gender-Bend(er) ing’ Male Identity: First Steps in Search of a Critical-Discursive Approach to Gay Literature Translation”, Cadernos de Tradução, Vol. 13, URL: https://periodicos.ufsc.br/index.php/traducao/article/view/6234/5851 (accessed 26 April 2014). Kang, Ji-Hae (2007) “Recontextualization of News Discourse”, The Translator: Studies in Intercultural Communication 13, no. 2: 219-42. Khanjan, Alirea, Amouzadeh, Mohammad, Eslami Rasekh, Abbas, and Manoochehr Tavangar, (2013) “Ideological Aspects of Translating News Headlines from English to Persian”, Meta: Translators’ Journal 58, no.1: 87-102. Kuo, Sai-Hua and Mari Nakamura (2005) “Translation or Transformation? A Case Study of Language and Ideology in the Taiwanese Press”, Discourse and Society 16, no. 3: 393- 417. Laker, Eva (2008) Power, Islam and Political Elite in Iran. A Study on the Iranian Political Elite from Khomeini to Ahmadinejad, Leiden & Boston, Brill. Lefevere, André (1992) Translation, rewriting, and the manipulation of literary fame, London, Routledge. Ietcu-Fairclough, Isabela (2008) “Critical Discourse Analysis and Translation Studies: Translation, Recontextualization, Ideology”, Bucharest Working Papers in Linguistics, Vol. 2, URL: https://www.ceeol.com/search/article-detail?id=61189 (accessed 25 March 2015). Leverett, Flynt and Hillary Mann Leverett (2013) “Consequences of Western Intransigence in Nuclear Diplomacy with Iran”, Aljazeera, 10 May, URL: http://www.aljazeera.com/indepth/opinion/2013/05/2013589151459212.html (accessed 15 June 2014). 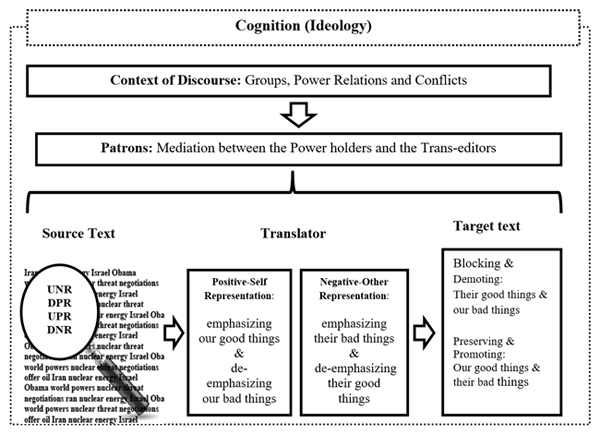 Loupaki, Elpida (2010) “Investigating Translator's Strategies in Rendering Ideological Conflict. The Case of News Translation” in Political Discourse, Media and Translation, Christina Schäffner and Susan Bassnett (eds), Newcastle, Cambridge Scholars Publishing: 55-7. Mearsheimer, John and Stephen M. Walt (2006) “The Israel lobby and US foreign policy”, Middle East Policy 13, no.3: 29-87. Munday, Jeremy (2007) “Translation and Ideology: A Textual Approach”, The Translator: Studies in Intercultural Communication 13, no. 2: 195-217. Noorollahi, Mohammad Hossein (2005) Persian-English Dictionary of Politics and Journalism, Tehran, Rahnama Publications. Orengo, Alberto (2005) “Localising News: Translation and the ‘Global-National’ Dichotomy”, Language and Intercultural Communication 5, no. 2: 168-87. Purzycki, Michael (2013) “War with Iran: Full Diplomatic Relations Are the Best Option for the U.S. and Iran”, Policy.Mic, 7 June, URL: http://mic.com/articles/45447/war-with-iran-full-diplomatic-relations-are-the-beoption-for-the-u-s-and-iran (accessed 18 July 2015). Ritcher, Paul (2013) “Ryan Crocker Says U.S. is Fumbling on Iran's nuclear Program”, Los Angeles Times, 25 May, URL: http://articles.latimes.com/2013/may/25/world/la-fg-iran-sanctions-20130526 (accessed 15 June 2015). Sanatifar, Mohammad Saleh and Ali Jalalian Daghigh (2018) “Translation as re-narration: a case of Iran’s nuclear program as circulated in the Western and Iranian media”, Asia Pacific Translation and Intercultural Studies 5, no. 1: 1-18. Schäffner, Christina (2004) “Political Discourse Analysis from the Point of View of Translation Studies”, Journal of Language and Politics 25, no. 1: 117-50. ---- (2005) "Bringing a German voice to English-speaking readers: Spiegel International." Language and Intercultural Communication 5, no. 2: 154-67. ---- (2010a) “Political Communication Mediated by Translation” in Perspectives in Politics and Discourse, Urszula Okulska and Piotr Cap (eds), Amsterdam, John Benjamins Publishing Company: 255-78. ---- (2010b) “Cross cultural Translation and Conflicting Ideologies” in Translation and Cultural Identity. Selected Essays on Translation and Cross-Cultural Communication, Micaela Muñoz Calvo and Maria del Carmen Buesa Gomez (eds), Newcastle, Cambridge Scholars Publishing:107-27. ---- (2012) “Unknown Agents in Translated Political Discourse”, Target: International Journal on Translation Studies 24, no.1: 103-25. Shojaei, Amir, Youssefi, Kazem, and Hossein Shams Hosseini (2013) “A CDA Approach to the Biased Interpretation and Representation of Ideologically Conflicting Ideas in Western Printed Media”, Journal of Language Teaching & Research, Vol. 4, URL: http://www.academypublication.com/issues/past/jltr/vol04/04/28.pdf (accessed 26 August 2015). Takeyh, Ray (2013) “The Best Redline for a Nuclear Iran”, The Washington Post, 31 March, URL: http://www.washingtonpost.com/opinions/the-best-red-line-for-a-nuclear-iran/2013/03/31/9e9397dc-933c-11e2-ba5b-550c7abf6384_story.html (accessed 15 April 2015). Taslimi, Tala (2013a) “Nooshdarooyee Bename Ravabete Deeiplomatike Kamel” (A Panacea with the Name of Full Diplomatic Relations), Iranian Diplomacy, 13 June, URL: http://www.irdiplomacy.ir/fa/page/1917163نوشدارویی+به+نام+روابط+دیپلماتیک+کامل/ (accessed 11 July 2015). ---- (2013b) “Be Emtiaz Dehi Be Iran Fekr Konid Aghayan” (Gentlemen, Consider Giving Privilege to Iran), Iranian Diplomacy. 31 May, URL: http://www.irdiplomacy.ir/fa/page/19166/به+امتیازدهی+به+ایران+فکر+کنید+آقایان (accessed 10 June 2015). Tsai, Claire (2005) “Inside the Television Newsroom: An Insider's View of International News Translation in Taiwan”, Language and Intercultural Communication 5, no. 2: 145-53. Valdeón, Roberto Antonio (2007) “Political and Sexist Bias in News Translation: Two Case Studies”, TRANS, Revista de Traductología, no.11: 231- 43. ---- (2008) “Anomalous News Translation: Selective Appropriation of Themes and Texts in the Internet”, Babel 54, no. 4: 299-326.
van Dijk, Teun. A (1993a) “Principles of Critical Discourse Analysis”, Discourse and Society 4, no. 2: 249-83. ---- (1993b) “Discourse and Cognition in Society” in Communication Theory Today, David Crowley and David Mitchell (eds), Oxford, Pergamon Press: 107-26. ---- (1998) Ideology: A Multidisciplinary Approach, London, Sage Publications. ---- (2001) “Critical Discourse Analysis” in Handbook of Discourse Analysis, Deborah Tannen, Deborah Schiffrin and Heidi Hamilton (eds), Oxford, Blackwell: 352-71. Vuorinen, Erkka (1995) Source Text Status and (News) Translation, Aspectus Varii Translationis. Studia Translatologica, Ser B, no. 1: 89-102. The term trans-editor is preferred and used by some scholars researching news translation (for example, Hursti 2001; Bielsa 2010). This is because in the context of news translation, the translator is not the only person who decides on translation, but his/her work is edited by other people such as the senior translators, editors and the chief editor to meet the policies of the news institutions. "EU 3 + 3" refers to a grouping which includes the EU-3, three European countries including France, the United Kingdom, and Germany as well as three other non-European permanent members of the United Nations Security Council including China, Russia, and the United States. In the United States and Russia, it is more commonly known as P5+1, which refers to the five permanent members of the UN Security Council plus Germany. Ali Jalalian Daghigh has a doctoral degree in Applied Linguistics/Translation Studies from Universiti Sains Malaysia. He has a number of publications and has presented in several international conferences. His main research areas are (Critical) Discourse Studies, Journalistic/News Translation, Cross-cultural studies and Language Pedagogy. Mohammad Saleh Sanatifar has a doctoral degree in Translation Studies from Universiti Sains Malaysia. The author has published numerous articles in specialized journals and has presented widely in international conferences. His main research interests are: translation theory, pragmatic aspects of translation as well as critical discourse translations. Rokiah Awang is a senior lecturer in Translation Studies at Universiti Sains Malaysia. She is the author and co-author of a number of journal papers and has presented in several international conferences. Her main research areas are Translation, journalism, News discourse and editing.